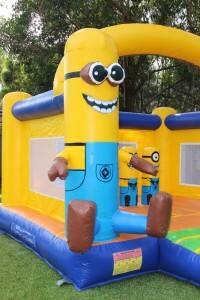 The Minions Jumping Castle is sure to be a hit, with our favourite friendly yellow friends ready to PAR-TAY! It will certainly be a crowd pleaser regardless of age or gender. It measures 4m long, 4m wide and 3.5m tall. It is completely open, allowing full view for supervising parents and a quick access should your little person get upset. The two internal character poles provide a little more entertainment as kids dodge, hide or cuddle their favourite Minion.